Which fight are you most looking forward to on May 5: GGG vs Martirosyan or Bellew vs Haye II? The night of May 5 was going to be a very special night for boxing fans (and may still prove to be so). We would of course have had the huge rematch between middleweight rivals Gennady Golovkin and Canelo Alvarez in Las Vegas and, as something of a bonus, over in London, the return fight between Tony Bellew and David Haye; which we still have. There would of course have been no real comparison between these two fights in terms of global significance, but now, with Golovkin – Canelo II falling apart (for now at least) it could be that the heavyweight rematch taking place in the UK (still on as we speak, hopefully with no last minute collapse due to an injury picked up by you know who) proves to to be the fight of the night. Maybe Vanes Martirosyan will please us all and give Golovkin what he is promising, a great toe-to-toe fight, but it seems fair to say many fans are not too thrilled or excited about the match-up that has replaced Golovkin vs. Canelo. That said, which fight are you most looking forward to on May 5 – Golovkin vs. Martirosyan or Bellew vs. Haye II? In terms of global importance, the world middleweight title fight remains bigger than Bellew and Haye going at it again, but in terms of action, of two-way action, might the heavyweight scrap deliver more than the 160 pound fight does? In all honesty, we have no real idea who wins the Bellew vs. Haye return, and isn’t it the sign of a good, value for money fight when nobody can with any real certainty pick the winner beforehand? Bellew won the first fight, shocking Haye and the odds, so nobody can say the rematch is a foregone conclusion for Haye – far from it, although injury-free (for now) the former WBA heavyweight champ is the slight favourite to get his revenge. Can anyone honestly, truly make a case for a Martirosyan win over Golovkin? A great effort and an exciting fight Vanes may make on May 5, but an actual win? That would result in Upset of The Year material. Haye and Bellew are the same size, Martirosyan on the other hand is not a full middleweight. Again, can you picture the super-welter beating long-reigning middleweight king Golovkin? Hopefully we will get great action and value for money from BOTH fights but, quite amazingly, it has to be the heavyweight return taking place in London that gets the pick for most interesting, tough to pick and evenly matched fight. If you could only watch one of these two fights on May 5, which would you honestly choose? 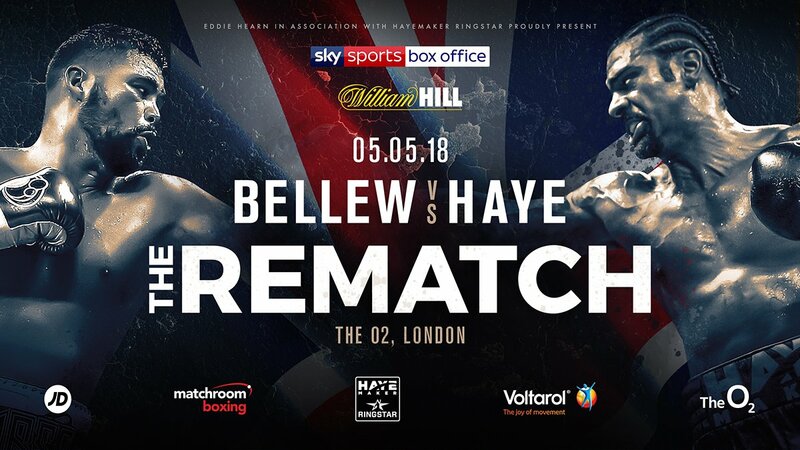 You are here: Home / Boxing News / Which fight are you most looking forward to on May 5: GGG vs Martirosyan or Bellew vs Haye II?